Tawnyanruddia is the 468th highest place in Ireland. 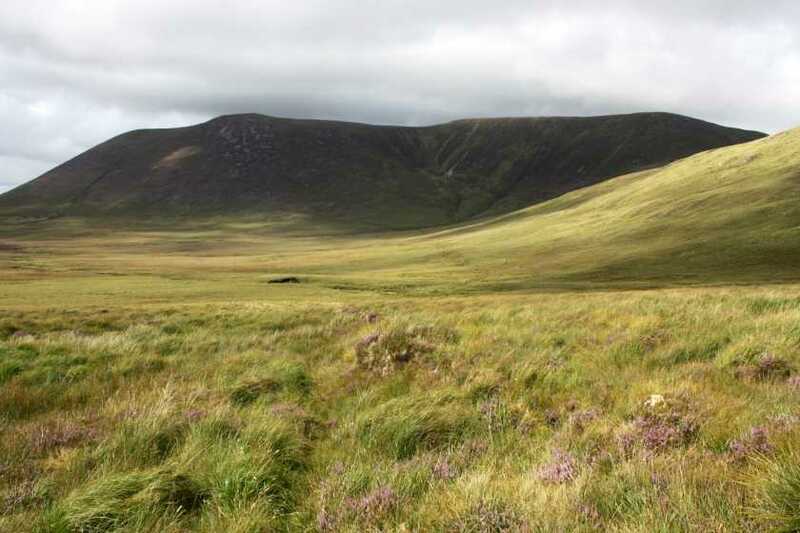 Tawnyanruddia is a minor excrescence on a substantial spur running south-west from the remote massif of Slieve Carr, lacking the scale and distinction of the parent but sharing its remoteness and remarkable outlook. Any approach to Tawnyaruddia is likely to be made as either a diversion on the way to/from Slieve Carr, or by adapting one of the northerly or southerly approaches to that summit. These will invariably be along the Bangor Trail, either from Bangor Erris at the northern end, or from the Brogan Carrol hut to the south at (F96814 05574 A). From the trail Tawnyanruddia can be climbed almost anywhere up its southern or western slopes: the ascent is steep but is otherwise free from difficulties. Alternatively it is a short sidetrip on the ascent of Corslieve from Scardaun Lough to the south. As isolated as Slieve Carr felt at the time, Tawnyanruddia felt even more so as it lacked a trig pillar and cairn or any other obvious human touches. A small rocky outcrop, eroded bog with granite stones peeking out, and windswept heathery grass marked the summit area. It was a straightforward 380m haul up from the Bangor Trail, with more and more astonishing views of the vast, uninhabited, Owenduff bog opening up as elevation was achieved. The sense of isolation on the slopes of Tawnyanruddia was palpable, and one that I’ve rarely experienced elsewhere. I found myself paying more attention to detail such as where I put my feet with each step or how much water I drank – partly because I was ‘in the moment’ and partly because there was an acute sense of the dire consequences of making a mistake and twisting an ankle or becoming dehydrated in this lonely place. There are some areas of exposed rock and scree on the southern slop which are easily avoided. 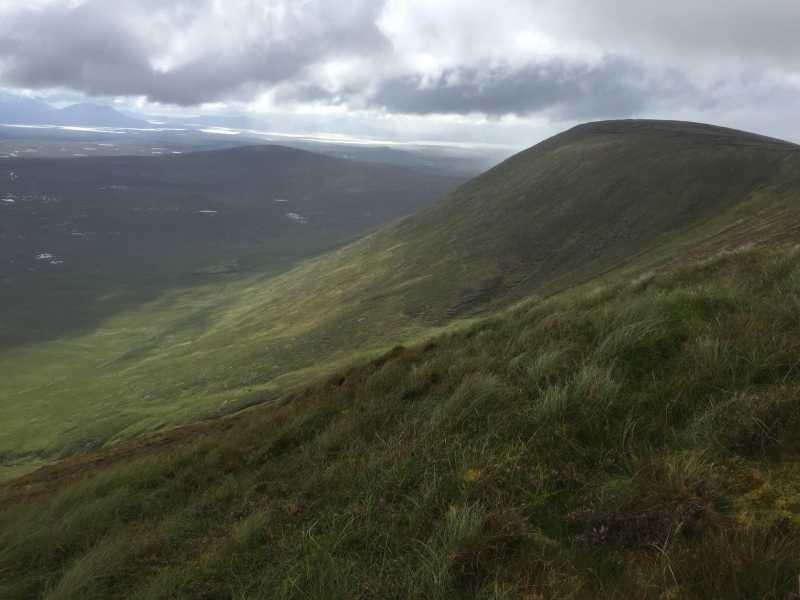 While Tawnyanruddia is easily reached from the Bangor Trail, or while descending Slieve Carr, it still requires a huge commitment of time and effort. I see that all other GPS tracks for Slieve Carr bypass Tawnyanruddia which reinforces my view that perhaps this is an area where more time and less haste is recommended. Of course Tawnyanruddia will no doubt now feature on future expeditions up Slieve Carr now that it has been ‘named’ as a summit! It was with a mixture of entertainment and dismay that I saw the many efforts since 2010 by members to find the quickest and easiest way up Slieve Carr. The reputation for remoteness and near wilderness that this summit area holds was being dismantled gleefully with each new forest track and bridge discovered that would bring people closer and closer to the slopes of these hills. While adding to our options for accessing this area, it also takes something away. I say take your time, explore, enjoy!